Price for renting a Ferrari with delivery to Italy varies depending on the charter days and the Ferrari model you want to rent. Rental can be daily, weekly or monthly. In Sardinia with delivery to Porto Cervo, Porto Rotondo, Olbia, Alghero, Cagliari, Sassari, Nuoro. In Sicily with delivery to Taormina, Palermo, Catania, Messina, Ragusa, Siracusa. Thanks to the number of Ferrari available with delivery across Italy, it is possible to organize individual or group tours with a wide choice of models and colors. Thanks to the exclusive services offered by KLR, the most demanding customers will be able to request the FERRARI 488 GTB rental, available for short term daily, weekly or monthly rental. Driving a ferrari 488 GTB is a privilege of few and the possibility of renting it is even smaller. There are very few in Italy and KLR can boast this exclusive opportunity. Number 488 has a very precise meaning and indicates the relation between the total displacement (3,902) and the number of cylinders (8). Use a calculator and do this 3902 split split 8. The result will be 488. In Tuscany with delivery to Florence, Siena, Lucca, Arezzo, Pisa, Livorno, Prato, Massa e Carrara, Grosseto, Pistoia, Asciano, Bagno a Ripoli, Barberino Val D'Elsa, Bibbona, Buonconvento, Campiglia Marittima, Capannoli, Capolona, Casole d'Elsa, Castellina in Chianti, Castelnuovo Berardenga, Castiglione della Pescaia, Cinigiano, Colle di Val d'Elsa, Cortona, Figline Valdarno, Firenze,Follonica, Forte dei Marmi, Gaiole in Chianti, Gambassi, Gavorrano, Impruneta, Lucignano, Monsummano Terme, Montecatini Terme, San Giuliano Terme, Montaione, Montalcino, Monte Argentario, Monte San Savino, Montepulciano, Monteriggioni, Monteroni d'Arbia, Montespertoli, Mugello, Orbetello, Panzano in Chianti, Pari, Peccioli, Pelago, Pienza, Pietrasanta, Porrona, Porto Ercole, Portoferraio - Isola d'Elba, Pratovecchio, Punta Ala, Radda in Chianti, Rapolano Terme, San Casciano dei Bagni, San Casciano in Val di Pesa, Tavarnelle Val di Pesa, San Giovanni d'Asso, Sansepolcro, Saturnia, Scarlino, Sorano, Sovana, Terranuova Bracciolini, Torrita di Siena, Trequanda, Lajatico. It's the most exclusive sports car available from Maranello. The rigid roof opens completely, leaving the driver the pleasure of an open-air drive. It can also be operated while driving, at a maximum speed of 45 kilometers per hour. And so you can admire the beautiful Italian hills, breathing the scents of this fantastic land, while the foot presses into the accelerator giving emotions never experienced. The interiors are real sporting, perfectly combining performance and aesthetics. The steering wheel of the Ferrari 488 Spider is a true control center, with an infinity of buttons to keep control of the entire car. Marche with delivery to Pesaro, Urbino, Ascoli Piceno. Basilicata: with delivery to Matera, Maratea. In Puglia: with delivery to Bari, Gallipoli, Monopoli, Fasano, Ostuni, Polignano a mare. Friuli Venezia Giulia: with delivery to Gorizia Pordenone, Duino Aurisina, San Floriano del Collio, Capriva del Friuli, Bruttio. Liguria with delivery to San Remo,Finale Ligure, Genova, Portofino, Sestri Levante, Sarzana. Emilia Romagna: Compiano, Vernasca, Montegridolfo, Castrocaro Terme, Cortemaggiore, Rimini, Riccione, Bologna, Modena, Maranello, . Available for daily car hire, the Ferrari 488, proclaimed just these days as the winner of the best 2017 engine. The V8 biturbo has ripped off all its competitors, getting to the top of the well-deserved best engine prize in the world. It's just this engine that you can tune between brakes, gear changes and a perfect trim that keeps you attached to the ground even in the present of bends or elbows. But the Ferrari 488 will not be the only one available for luxury car hire. 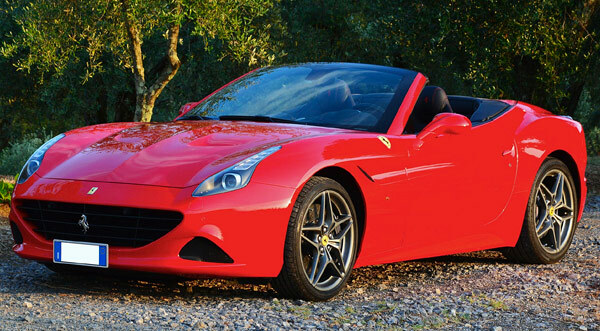 You can also choose Ferrari California and the Ferrari 458 in the Spider, Cabrio or Italy model. Karisma Luxury Rental, A 5 star service with delivery in all Italy. 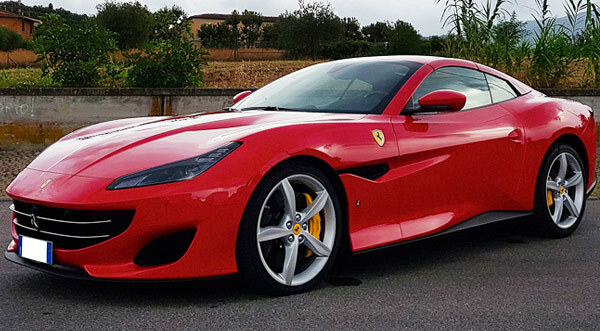 Karisma Luxury Ferrari Rental: 4 different Ferrari models at your full disposal, to ride across the most impressive and exciting Tuscany roads. In just five minutes you could hold in your hands the keys for the car of your dreams. You could choose among Ferrari California, Ferrari 458 Italy, Ferrari 458 Spider and Ferrari 458 Special. The Tuscany most famous city has really many treasuers to offer to our VIP clients, as the gorgeous art galleries preserve the incredible works by Leonardo da Vinci, Giotto and Michelangelo; or the luxury of the most beautiful palaces where the Medici Family and Lorenzo il Magnifico lived, as Palazzo Pitti and Palazzo Medici Ricciardi. After having admired the centre of Florence, with Ponte Vecchio, The David of Michelangelo, Piazza Signoria and the Uffizi Gallery, we will move few km out of the town, toward the most beautiful spa centre of Tuscany. Here a relaxing and cleansing bath, surrounded by a suggestive nature. Lake Como is the place for excellence in worldliness and luxury in Italy. This is where the most exclusive and elegant events are held, in the magical setting of Villa d'Este, in the starred restaurants overlooking Lake Como and the Grand Hotel, with breathtaking views. Driving for Lake Como's bends on a luxury Ferrari is the dream of many and that's why Karisma Luxury Rental has made available a huge range of Ferrari models available for daily, weekly and monthly rentals. Reach the most fascinating places of Lake of Garda such as Sirmione, Desenzano and Montichiari, Riva del Garda, the Benacolo Towers, the Monte Castello Sanctuary of Tignale, the Forra di Tremosine. Charming places where luxury and elegance are at the forefront. 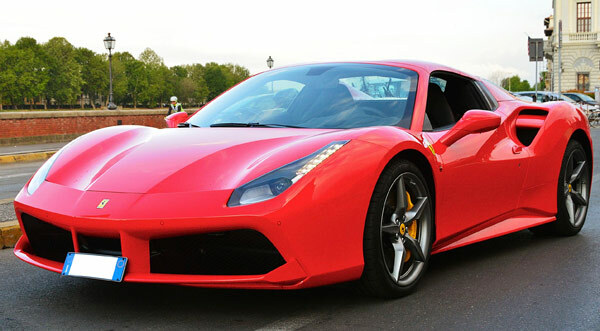 FERRARI RENTAL PRICE: To know the Ferrari rental price, please fill out the form on this page. The price is modular and the price difference depends on the model chosen, from the rental dates and the services requested. DELIVERY PLACE IN ROME: Ferrari can be delivered to the port of Civitavecchia, directly at the terminal exit where the cruises arrive, at Ciampino Airport and at Fiumicino Airport. It is possible to request the delivery of Ferrari in the center of Rome, near Termini Station or in one of the many luxurious hotels or luxury villas. It's considered the most impressive and romantic of all the Italian cities and that is why the brand of Rampant Cavallino is very much requested in this area. Verona, the land of the lyric, the Verona Arena, the historic terrace where Juliet and Romeo met on summer evenings, is highly appreciated by foreign tourists who want to combine luxury and wonder for their holidays in Italy. There are a lot of requests from those who want to rent a Ferrari with delivery to Verona, both in the city center where the most prestigious hotels and the most exclusive villas are located, as well as at the Verona Villafranca VRN airport, where the Ferrari keys are delivered Directly at the exit of the Gate. Rental period and prices for Ferrari rental in Verona. The price to rent a Ferrari varies depending on the model chosen and the rental period. We recommend completing the form on this page to request a custom quotation. Karisma Luxury Rental is the landmark for anyone wishing to rent a luxury Ferrari with delivery to Bologna center or Bologna airport. Bologna and Bologna airport are a strategic place for those arriving from abroad in Italy. And here, where the biggest flights from the cities of Russia and the Middle East are concentrated, and places like Rimini, Riccione are the meeting point of the sport and jet set national and international. What's better than running these wonderful roads on a flaming Ferrari ? The most recognizable design is Flavio Minzoni's work and thanks to this unmistakable line, the Ferrari 488 GTB in 2016 won the Red dot Best of the Best prize, the prestigious prize of aesthetics. Cross all Italy and visit the most beautiful art towns in the world From Florence to Rome, Venice, Bologna, Turin, Milan, Naple and all the biggest italian towns on board of an elegant Ferrari, thanks to the One Way Service. Live an exclusive experience through art, luxury landscapes and splendour all made in Italy. Vineyards, olive groves and amazing itineraries across the most exclusive landscapes from Rome to Florence. Thanks to the One Way Luxury Car rental you could discover the most romantic views in Italy, with an itinerary tailor made according to your needs. Ask for a quote for the rental car of your dreams. You could ask all your questions to our One Way representative, to get suggestions and ideas to discover the most beautiful paths between Rome and Florence. We perfectly know the territory of Tuscany and Lazio, and we are able to suggest you the most suitable cars and the most exciting roads crossing this sunny land, among vineyards stripes, exclusive caninas, villas and ancient monasteries. "Ferrari 488 rental Milan Italy"
Every day I drove a different Ferrari (they have available 6 between Ferrari California in red and black, red Ferrari 458 Speciale, red Ferrari 458 Italia and Ferrari 458 Spider red and black). My favorite remains the Ferrari Spider. They are very accurate with the times and I have always had close contact with my personal assistant who also gave me great advice on where to eat in Versilia.